These street food style fruit cups made with mango, orange, lime juice and coconut are a healthy snack. I love a good, healthy snack, and I’m always tempted to stop whenever I see a fruit cart on the street. Throughout Mexico, you’ll find these street food vendors with all different seasonal fruits that they’ll cut up and put in a cup and top with chile powder, Tajín, chamoy or some kind of bottled salsa. Mango and orange go great together (mangonadas, anyone? ), but you can also add other ingredients to this base, such as jicama for crunch, watermelon or strawberries. These street food style fruit cups are versatile, healthy and easy to make. 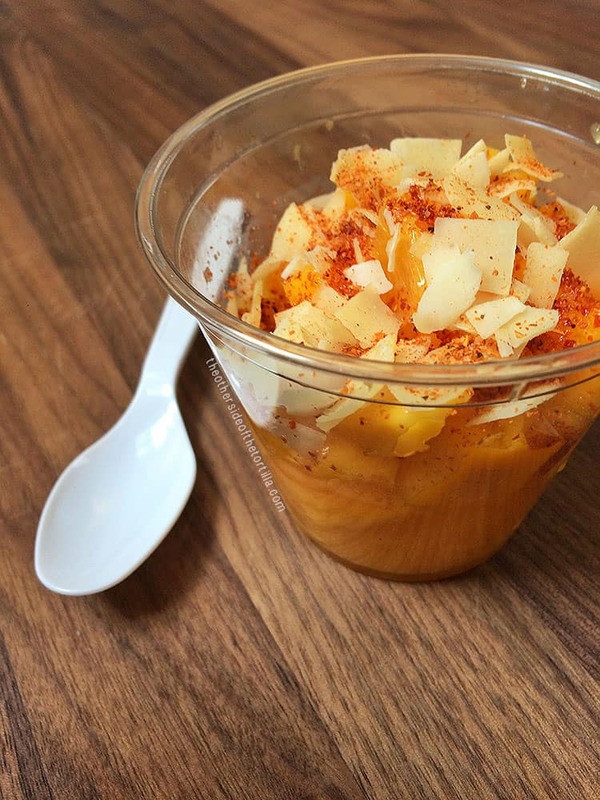 This recipe calls for Ataulfo mangoes, which are in season from March through July, but Kent or Tommy Atkins varieties are suitable substitutes when Ataulfo mangoes aren’t in season. The Ataulfo variety is sweet and firm with little to no fibers, and the skin is yellow. It turns golden as it ripens further, and also has small wrinkles in the skin when it’s fully ripened. If you’re feeling ambitious you can also make your own roasted coconut chips with this step-by-step tutorial. This recipe is gluten-free and vegan-friendly. 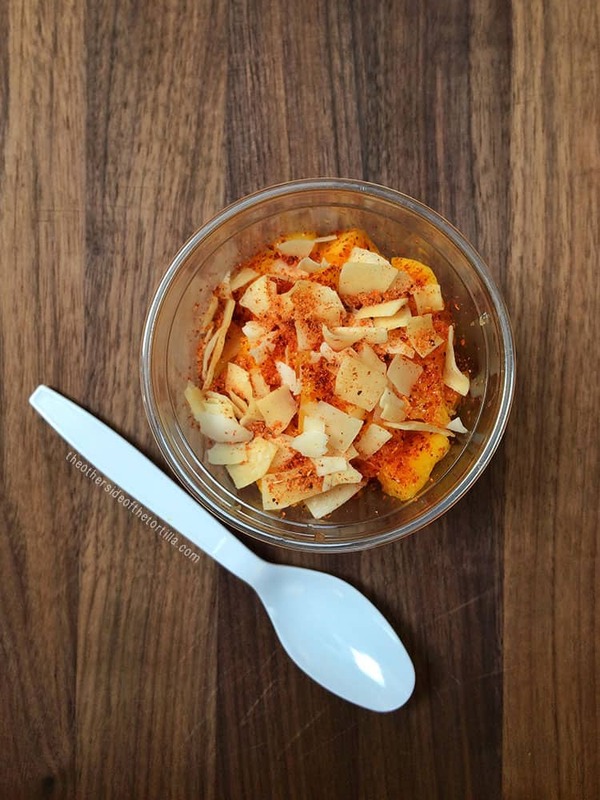 Make this street food-style fresh fruit snack at home with just mango, orange, lime, coconut and Tajín! Peel and dice the mango and put the flesh in a bowl. Section the orange by cutting off the top and bottom of the orange, carefully slicing the rest of the peel off, and cutting vertically into each section of the orange (between the membranes) and place the sections into the bowl with the mango. There will still be some juice and flesh in the orange; squeeze it over the bowl to get all the juice and then discard the pith and membranes. Squeeze the juice of half a lime over the top of the mango and orange sections. Add roasted coconut chips and stir gently to incorporate. Transfer to a cup and sprinkle with 1 teaspoon of Tajín, or to taste. Eat with a spoon. The mango, orange and lime can be prepared in advance and refrigerated to eat later; just leave the coconut chips out until you're ready to serve so they don't get soggy. Add Tajín and you're ready to eat! Qué rico! Me encanta lo simple de esta receta! Must try!